Zatkoff offers Quad® Ground Rubber Balls exclusively from Minnesota Rubber, our world-renowned manufacturing partner. Precision-molded for exceptional performance in critical industrial application, these balls are manufactured from high-speed, centerless grinding and precise gauging and measuring equipment. 70 Shore A is the most common compound; however, rubber balls are also offered in a variety of elastomeric compounds for a variety of applications, including steam, high temperature, and corrosive fluid resistance. In general, these solid, non-reinforced ground rubber balls are used as check devices for pressures less than 120 psi; at greater pressures than this, the ground balls tend to get stuck in the ball seat or checking orifice, which can eventually damage the ball and cause it to extrude through the orifice. 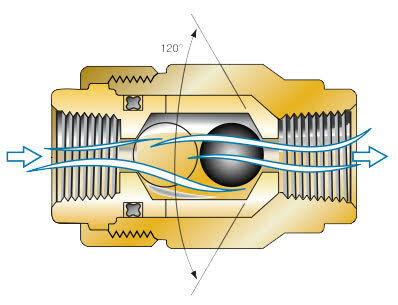 To ensure effective sealing, the diameter of the check ball should be at least three times the diameter of the flow orifice. The larger the ball-to-orifice ratio, the lower the risk for ball extrusion. The superior sealing performance makes the ground rubber balls useful in the most critical pneumatic and hydraulic applications. Ball seats should have an included angle of 120° and have a .010"-.015" radius where the seat and the flow channel meet. For liquids, the ball seat should have a surface finish of 20μin Ra or better; while for air or vacuum applications, the surface finish should be 10μin Ra or better. These come in a variety of standard sizes (see table below), or can be custom-made for specialized applications, including steam, high temperature, and corrosive fluid resistance. We offer molded rubber balls in addition to our ground rubber balls. Both come in a variety of rubber compounds, depending on your specific application needs. Minnesota Rubber & Plastics started in 1945 and has built an international reputation in its production of elastomers and thermoplastics; Zatkoff gives you access to their high-quality products in various sizes and quantities. Our breadth of knowledge will help you discover which ball type and compound fits your needs. Contact us today to learn more about our Quad® Ground Rubber Balls, and other many other sealing solutions.